The Bishops have helpfully loaned Eddy's services to the Waterhole for the day, as most of their staff are ill. A sweaty Joe arrives, defending Bouncer's honour as Clarry accuses him of leading his dog astray. It's clear that there is more on Joe's mind - he is mulling over the argument he had with Kerry. 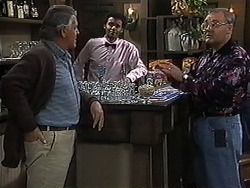 Clarry changes the subject by challenging Joe to a game of darts. Taking the bait, Joe tells him the fateful duel will take place once he is finished work. 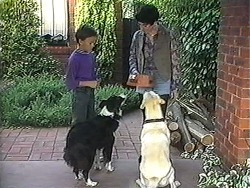 Toby arrives with Bouncer in tow - he's got in trouble with the headmistress for stealing lunches from children. Right on cue, the Bonnie to his Clyde appears as an exasperated Toby sighs. Kerry scolds Bouncer who at least has the decency to bow his head in shame, whilst Rosie the brazen hussy surveys her work. As punishment, Bouncer will be locked up for a while. 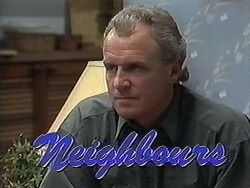 Toby tries to gently break it to Rosie that she's bad news for Bouncer, and Kerry decides to bring it up with Clarry. Helen is recounting a letter from Nick to Bev: he has fallen in love with an English girl and his art is taking a back seat. A defeatist Bev offers him luck, before it inevitably goes sour. She is still feeling down about the argument she had with Kerry as her friendship was keeping her going throughout the divorce. Helen urges her to tell Jim she still loves him, but Bev is afraid of rejection. Helen quizzes her on how she would feel if Jim were seeing someone but Bev is reminded about her accusation of an affair in New York, so wouldn't jump to that conclusion again. Helen looks awkwardly into her cup. Jim is looking for Caroline - he's a little late to a meeting they'd arranged. Clarry's words of wisdom #36: Never leave a pretty girl waiting, she might slip through your fingers. He then traps Jim with another tale of his adventures. 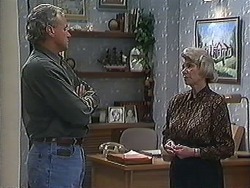 Joe corners Bev, enquiring about whether she has managed to talk Kerry out of the home birth plan yet. Her efforts ended in another argument so she thinks it's a lost cause but she is Joe's only hope. She agrees to pop in and discuss the matter with Kerry once more. Harold has arrived to offer Eddy a lift but he isn't going anywhere - he has to work the next shift too as someone else has phoned in sick. 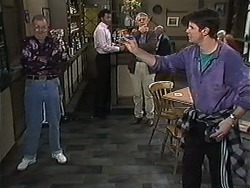 Eddy challenges Harold to join the game of darts, teasing him about Madge. CLARRY: I hear that delectable wife of yours is at a committee meeting. 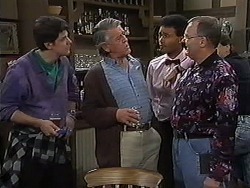 A shocked looking Harold is reluctant to join but Eddy takes him aside and asks him to humour Clarry, and to try and calm his drinking. Harold agrees - as long as Clarry tells him what he has to aim at! Caroline phones Jim and explains she had to wait for the client as his plane was delayed. They arrange a date for later that evening. Dart's Tournament of the Century is ongoing and all is not well for Joe. Whilst Harold is showing off his mad skillz with the dartboard, Joe is struggling to hit it. 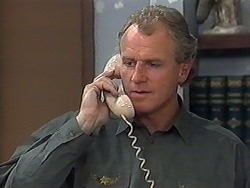 Clarry finishes up for the ‘Harry and Clarry' team whilst Joe announces it's time to leave. CLARRY: Why don't you give that lovely bundle of cuddle a ring, tell her to come down here after the meeting. HAROLD: I must insist that you stop referring to my wife in those intimate terms. A surprisingly angry Harold even cracks out the annoyed finger wave. 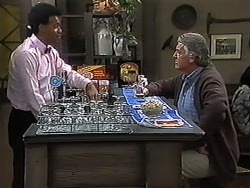 A diplomatic turn from Eddy defuses the situation and the two of them agree to start a new game. Helen and Jim are arguing about his mystery woman. 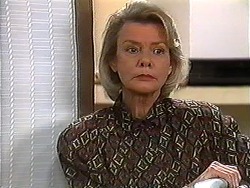 He is sure she has told Bev all about it but she insists she kept her mouth shut, even though she isn't happy about seeing the two people she cared about most being torn apart by each other. Helen thinks that if there is any chance the mystery relationship may develop then Jim should tell Bev - that way she won't get her hopes about saving the marriage up. He doesn't want to but Helen convinces him that Bev would be devastated about hearing it from elsewhere, so he agrees to inform her. Bev, Kerry and Toby are waiting for Joe to come back. 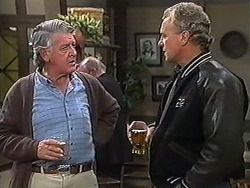 As he comes in Kerry tells him that she and Bev have come to an agreement on a solution - she will have the baby in a birthing centre as it provides a peaceful environment for the birth and they are attached to a hospital so medical help is only moments away. 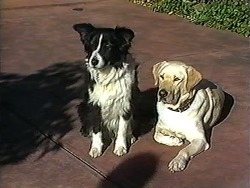 Bev would like to be there, and Toby and Sky can be there too. She turns down Kerry's invitation to dinner - she has some more happy news to give to an expectant father. Kerry wishes her luck. Harold has continued his winning streak and wants to go home but Clarry won't stop until he is winning. 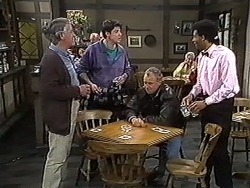 Harold leaves and Clarry suggests an official tournament at the pub. Beverly has arrived and Jim tells her he tried to call. She asks why and he tells her that they shouldn't be bitter - no one expected it to end this way. She asks him to go on as he looks at a loss for words.